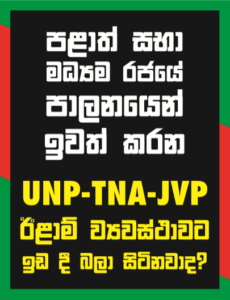 The affable TNA parliamentarian Mr. MA Sumanthiran has recently authored an essay definitively entitled ‘Self Determination: Myth and Reality’ in the Sunday Edition of Ceylon Today (July 29, 2012, p 9). It brings into sharp relief the central dilemma of post-war nation-building and state-building, be it from above or below, by state and civil society, by this or any other administration. Historians agree that there was no bitter division or explosive violence between the Tamils of the north and the Sinhalese of the south until the constitutional changes introduced by the British in the early twenties and thirties led to the rise of communalism in the north, particularly with Sir. Ponnambalam Arunachalam leaving the broad, multi-ethnic Ceylon National Congress to form the narrow communal organisation, the Tamil Mahajana Sabhai in 1921.